The new A-Class will come in three flavors to satiate every taste. 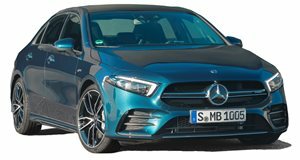 Mercedes-Benz and its AMG underling have been in search of whitespace between its entry-level, 250 compact models and the balls-to-the-wall AMG 45s. With the forthcoming A-Class, it seems AMG has found an exploitable sliver and will begin its thin-slicing with a new Mercedes-Benz A35. in Mercedes' the compact-car ladder before, but now Mercedes-AMG boss Tobias Moers has confirmed with (via ) how much power that car will put to the ground. “There will be a new AMG 45, but in addition to that, we will launch an AMG 35 with around 300 horsepower,” Moers revealed. Considering the A-Class uses the same engines as the CLA-Class and GLA-Class, expect those models to get 35-level derivatives as well. The 35-level cars likely won’t be built in the same one-man, one-engine manner as fully fledged AMG models, meaning a forthcoming A35 will likely rock the same 2.0-liter turbocharged engine as the A250 but with some hardening upgrades to handle a bit more boost. Mercedes-Benz will only sell the sedan version of the A-Class in the United States when it goes on sale later this year. Canadians will have the opportunity to put down their hard-earned cash on the hatchback, shown here. Rip-roaring AMG models will likely show up in 2019 as 2020 model year cars.